Water (during absorption and subsequent stages of growth). Temperatures adequate for metabolism and growth. In addition, light may or may not be necessary for germination. Figure 1. Velleia paradoxa (Goodeniaceae) seeds germinating at 20°C. Seed produce a mucilage coat soon after taking up water. Imbibition simply means the absorption of a liquid. Before attempting to germinate a seed, it is important to know whether the seed (or fruit) will imbibe water. In the laboratory this is determined by placing the seeds on moist filter paper at room temperature and then at hourly intervals for 8-10 hours, blotting the seeds dry and weighing them1. A gradual increase in seed weight indicates that the seed is absorbing water and is therefore ‘water permeable’. Water permeable seeds will absorb or lose water from the atmosphere until they come into equilibrium with their surroundings. When the temperature is suitable and there is an adequate supply of water and oxygen, most seeds absorb water and swell. The seeds are now well on their way to germinating. However, at least 15 families of angiosperms produce seeds with impermeable seed (or fruit) coats1. Such seeds cannot readily absorb water and therefore possess what is known as physical dormancy. Such seeds require very specific conditions in the field and specific treatments in the laboratory or at home, before they will germinate. Essentially this involves perforating the seed coat or removing the tissues surrounding the seed, to allow imbibition of water to help overcome physical dormancy. Bizarrely, germination of many Mistletoe species may actually be an exception to the rule that seeds must absorb water before they can germinate. Amyema preissii seeds (Wire-leaf Mistletoe, Loranthaceae), seem to be inhibited when the seeds are fully hydrated. Removal of the seeds from inside the berries allows seeds to lose moisture (known as seed desiccation), and germination then commences quickly2. The vast majority of seeds of plant species require oxygen to support germination, such as that found in air pockets between particles of lightly packed soil. In contrast, a number of aquatic and marshland species have been shown to require anaerobic conditions (conditions lacking oxygen), to initiate germination. For example Najas marina (Najadaceae), a pondweed of brackish water with a global distribution, has been shown to require total exclusion of oxygen to initiate germination. Subsequent seedling growth however did require oxygen (MSBP, unpublished data). 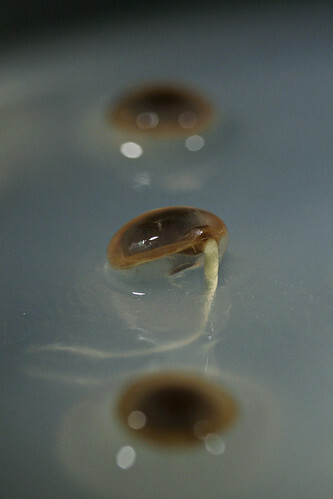 Germination temperatures vary greatly among plants. A plant’s natural environment, and more specifically the environmental conditions at the time of natural seed dispersal, will reveal information regarding the optimal temperature range for germination. More specifically, the conditions between the time of seed dispersal and the time of germination will reveal clues regarding not only germination temperatures, but also potential dormancy alleviating temperatures. Figure 2. Germination of Juncus kraussii (Juncaceae) at the TSCC. This species show a clear requirement for alternating temperatures to stimulate germination. 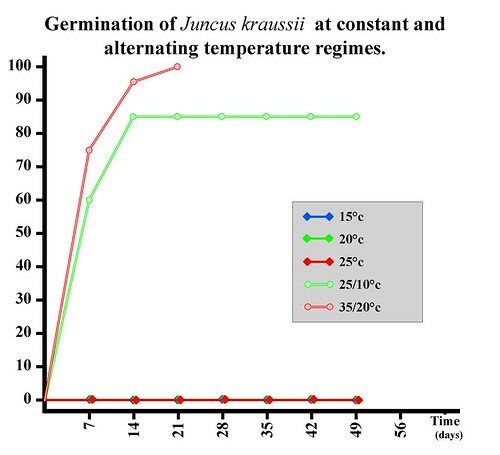 Alternating temperature regimes are often more favourable for germination than constant temperatures and some species will only germinate at alternating temperatures (for example, Juncus kraussii (Juncaceae), fig. 2). Such regimes are of course more reminiscent of what seeds would experience in their natural habitat, depending on environmental conditions and seed exposure. It has been reported that for a high percentage of a seed lot to germinate, the difference between high and low temperatures must be 10°C or more. However in some species, changes of only 1°C can be the difference between seeds and seedlings (studies cited in 1). Beneath well developed vegetation, soil is often insulated from the sun during the day and retains warmth during the night. Alternatively, when vegetation is cleared the soil surface receives a lot of warming during the day and loses heat rapidly at night, resulting in temperature fluctuations. These fluctuations diminish as a seed becomes further buried into the soil. Alternating temperatures are therefore significant to a seed as they indicate shallow burial and low levels of local plant competition; a potentially prime spot for germination. A preference for alternating temperatures has also been documented in aquatic plant species. In an aquatic environment, alternating temperatures indicate shallow water and a lack of neighbouring plants. Seeds of many species germinate equally well in light and darkness. Others have been found to germinate to higher percentages in light while a smaller proportion germinate better in darkness1. Studies have shown that small seeds often require light for germination while large seeds are usually indifferent to their exposure to light. These results support the general gardening rule that says that the larger the seed, the deeper it should be planted in the soil. 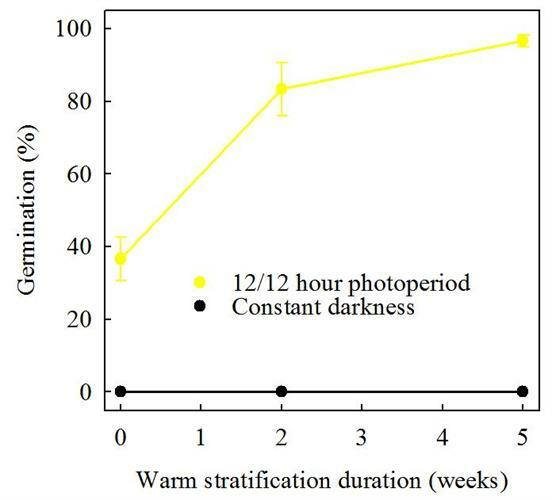 Germination of Goodenia fascicularis (Goodeniaceae) seeds collected in south-west Queensland, Australia required a warm stratification pre-treatment to alleviate dormancy, and light to terminate dormancy and trigger germination (fig. 3). Despite dormancy alleviation, seeds in darkness did not germinate. Obviously these seeds need to be on the soil surface in order to germinate after a warm, wet summer typical of south-west Queensland3. Figure 3. Percentage germination (mean ± s.e.) 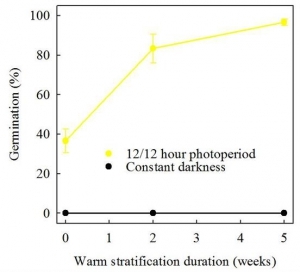 of Goodenia fascicularis seeds at 20°C, 12/12 hour photoperiod and constant darkness, after receiving increasing durations of warm stratification to alleviate physiological dormancy. Studies suggest that seeds may have evolved to use light as an indicator of whether they are under the soil surface or beneath a canopy or relatively close to other plant species that may complete not only for light but other resources. Tests carried out at the TSCC on the rare annual eyebright species Euphrasia scabra (Orobanchaceae) suggest that light is necessary for germination. On the contrary, studies at the Millennium Seed Bank Project have found that seeds of Trachyandra divaricata (Asphodelaceae), a tuberous rooted lily from South Africa, prefer to germinate in the dark. Trachyandra divaricata achieved 100% germination within 21 days at 10°C in darkness, but in the light it took over 140 days to achieve 50% germination (MSB, unpublished data). Ethylene, apples and flooding; a specific germination requirement! Some non-dormant seeds are particularly fussy and insist on something additional for germination. Schoenoplectus hallii (Cyperaceae) disperses dormant seeds in autumn and dormancy is alleviated over winter if seeds are buried in moist soil. Once dormancy is lost, non-dormant S. hallii seeds germinate throughout summer if exposed to flooding, light and ethylene. Studies found that seeds of S. hallii produce a small amount of ethylene when they are flooded and that, when large numbers of them are flooded in a relatively small volume of water, enough ethylene accumulates to promote germination. The ethylene germination cue may serve as a ‘flood-detecting’ mechanism signaling that water is available and competing species are absent4. In the laboratory 97% of S. hallii seeds germinated following 3 days of exposure to slices of apple, which are known to produce ethylene4. Some seed have been shown to respond to the presence of roots belonging to other plants. This response is particularly well recorded for certain members of the Orobanchaceae, a family of parasitic flowering plants. A number of Orobanchaceae general produce large quantities of very small seeds (not unlike orchids). Studies have found that the tiny seeds of Orobanche (Broomrape) and Striga (Witchweed) species are stimulated to germinate by complex organic compounds (termed xenognosins) excreted by the fine roots of certain plants. These chemicals decay rapidly in the soil therefore the seeds must to be within a few millimetres of the root. When the seed ‘smells’ the close presence of a suitable root it initates germination and grows towards the root (where the chemical concentration is highest) before pushing a specialised root (haustorium) into the unlucky host and stealing nutrients! Studies have shown that some Orobanche species exhibit a physiological dormancy and that their sensitivity to xenognosins fluctuate through the year due to changes in dormancy status. Baskin C and Baskin J. 2001. Seeds. Ecology, Biogeography and Evolution of Dormancy and Germination. London: Academic Press. Hoyle GL, Steadman KJ, Daws MI and Adkins SW. 2008. Pre- and post-harvest influences on seed dormancy status of an Australian Goodeniaceae species: Goodenia fascicularis F. Muell. & Tate. Annals of Botany. 102: 93-101. Baskin CC, Baskin JM, Chester EW and Smith M. 2003. Ethylene as a possible cue for seed germination of Schoenoplectus hallii (Cyperaceae), a rare summer annual of occasionally flooded sites. American Journal of Botany 90: 620-627.